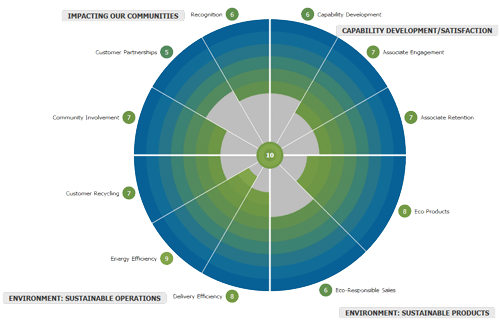 On Earth Day 2013, we launched the Integrated Rating Indicator for Sustainability (IRIS™), an interactive tracking tool developed by Loop used to set goals, track progress and visually report on our sustainability initiatives to all our stakeholders. There are so many other ways to be green every day. We’ve gathered some useful tips for you and your organization to practice at the office or around home. Turn off lights when they are not in use, and install sensors in offices and conference rooms. You can also reduce heating and cooling costs by adjusting thermostats in unused rooms, especially during off-hours at the office. Perform an energy audit to uncover key energy and cost-saving opportunities, such as improving insulation and air sealing, as well as installing compact fluorescent bulbs. You can also enable power management features on technology around the office. It’s one of the best ways to reduce your environmental impact and save money, too! Print on two sides and reuse scrap paper whenever possible. Set up areas for free exchanges of unwanted office supplies, furniture, and equipment. You can also donate unwanted items to local charities and organizations. Replace your traditional cleaning products with eco-conscious alternatives like our Sustainable Earth by Staples All-Purpose Cleaner made without harsh chemicals. There are so many options available today that are just as effective, plus they reduce the impacts on indoor air quality and chemicals on surfaces. In addition to choosing fuel-efficient vehicles, opt to take public transit or carpool with fellow co-workers. Try to consolidate errands, reducing multiple trips and distance travelled. Take your most fuel-efficient vehicle on longer trips, and use a GPS to avoid getting lost when heading to new locations. Recycled paper, toner cartridges, recycled desk accessories, and furniture products typically have reduced environmental impacts and deliver great quality as well. When it comes to paper products, look for post-consumer recycled content of 30% or more. For technology, make sure it’s ENERGY STAR® qualified. Purchase furniture that incorporates recycled content or has environmental certifications like Indoor Advantage, Green Guard, and Cradle to Cradle, a certification program based on product life cycle environmental impacts. And for facility products, consider options made without harsh chemicals. Conduct a waste audit that will help focus efforts and determine which waste items can be reduced through simple changes or recycling. Today, every office should be able to economically recycle mixed paper, cardboard, bottles and cans, cell phones, rechargeable batteries, and office technology. Small, inefficient orders can add significant program costs by increasing the number of POs, invoices and deliveries. The impact on the environment is considerable as well. Staples Advantage works with customers to reduce small orders by conducting campaigns that educate end users about the benefits of order consolidation. These campaigns have not only helped our customers dramatically reduce costs, but they’ve created significant environmental savings in the form of reduced packaging waste at facilities and reduced CO2 emissions from fewer Staples’ truck deliveries. Plan ahead and order once a week. Consider how much of each item your group or department needs and place one order. Order frequently used supplies in bulk so you’ll have them on hand. Group orders with co-workers and other departments to consolidate many smaller orders to fewer larger ones. Anticipate your needs for regular meetings, special projects, events, and new hires. From green cleaning supplies and practices to furniture, there are a number of ways Staples Business Advantage can help your business achieve LEED certification points.